UNH space scientists have long been members of a small and exclusive club – those who have taken up the challenge of detecting atomic neutrons hurtling through space. Now they're pointing a telescope closer to home in search of weapons of mass destruction. IMAGINE TRYING TO CATCH plankton on the high seas using nets designed to snare blue whales. Imagine further that the plankton exist for only a matter of minutes, that you are “fishing” blindfolded, and trying to cover the global ocean. It would be mighty slim pickins’ indeed. Space science technologies and techniques are being adapted to ferret out potential radioactive threats in shipping containers and buildings. So it is trying to detect and measure an atomic neutron while the infinitesimal, light-speed quick, short-lived, and electrically neutral particle hurtles through time and space – and right through everything it encounters along the way. In fact, for every 10,000 neutrons created by the force of galactic cosmic rays and that whiz through a detector, only one will leave the telltale sign that it's paid a visit. "They're slippery little devils," says Space Science Center (SSC) professor Jim Ryan. "Because a neutron has no electric change it just flies right on by – 'Don't bother me, I'm on my way' – it passes right through your instrument and no one will be the wiser," Ryan adds with characteristic folksy flourish. 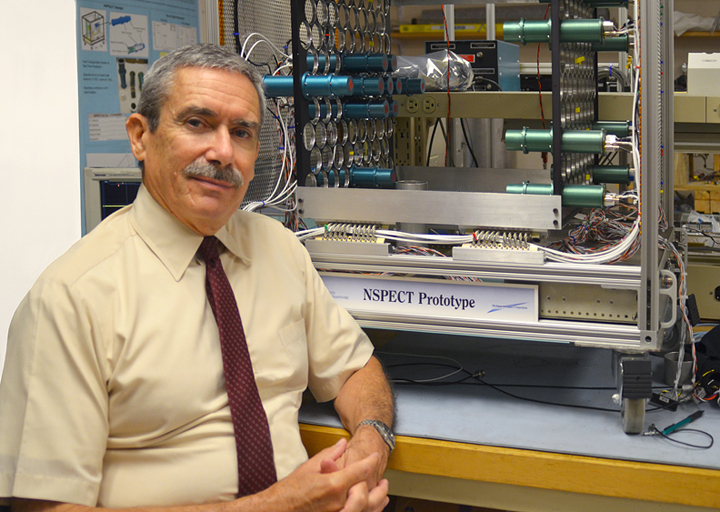 Professor James Ryan, with NSPECT prototype. Since graduate school at the University of California, Riverside, Ryan has made it his business trying to get wise to these slippery little devils, and his work has evolved from deep space detection of gamma rays and neutrons to that same quarry a bit closer to home. At the moment, he is the principal investigator for an instrument designed and built at UNH that will be used for zeroing in on radioactive sources in an effort to foil a potential act of terrorism. 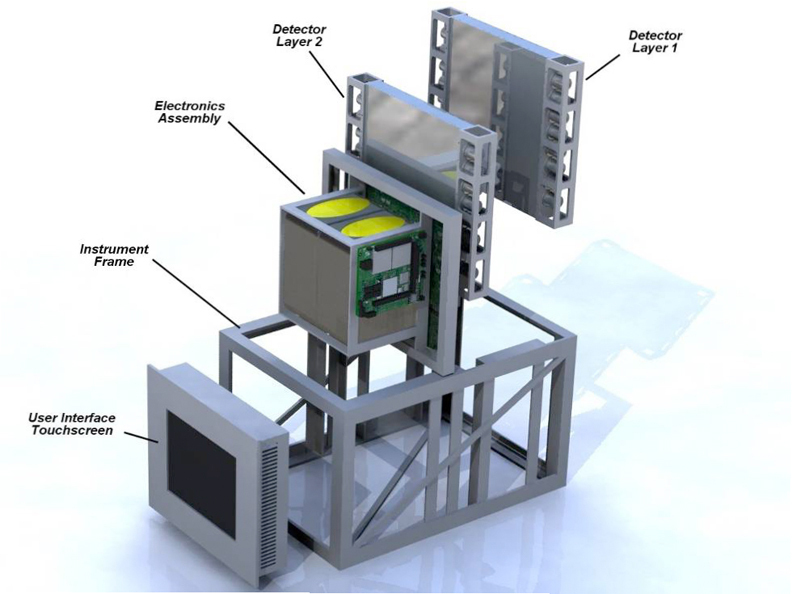 Development of the Portable Neutron Spectroscope, or NSPECT, is currently under contract with the Defense Threat Reduction Agency (DTRA), which is the U.S. Department of Defense's official combat support agency for countering weapons of mass destruction. The contract is in partnership with Michigan Aerospace Corporation, which is responsible for the support engineering that will turn the bench-top instrument into a rugged field-deployable device equipped with a nimble graphical user interface and live video imaging capability. "This type of capability doesn't exist at the moment," says Ryan. 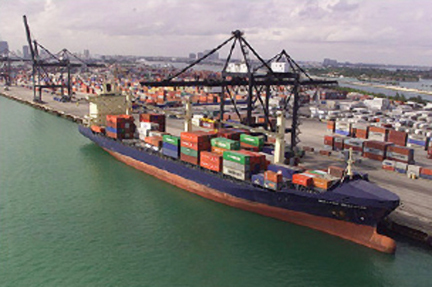 "There are several designs in development in the U.S. but, basically, what people have to do now is go into a building or a container and fish around in hopes of finding the source." He adds, "The expertise that has been acquired over many years in the space program can now be brought to bear on this problem to better find and locate nuclear bomb-making material." 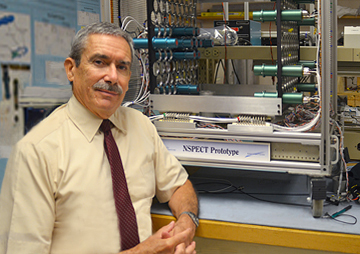 The development of NSPECT stands on the shoulders of cosmic ray/neutron detection work done for decades at UNH beginning in the mid-1950s when professor Jack Lockwood "launched" a detector by driving it up to the summit of Mount Washington in an effort to make measurements less filtered by Earth's atmosphere. But it would take the dawn of the space age to really push the physics forward. In 1958, as the United States' fledging space program got off the ground, the very first satellite – the little Explorer 1 rocket – carried onboard a simple instrument designed by James Van Allen to detect cosmic rays. Once in orbit Van Allen's instrument started clicking wildly and before long the instrument was completely saturated and stopped working. Scientists thought something had gone wrong with Explorer 1. Instead, the two "Van Allen Radiation Belts" had been discovered. With the finding came knowledge that these regions beginning at roughly 4,000 miles above the Earth posed a real radiation hazard to future space exploration, including manned space flight. This drove the subsequent scientific investigations. At the time it was believed that neutrons generated in the atmosphere by galactic cosmic rays were the source of particles in Earth's newly discovered radiation belts. Scientists postulated that cosmic rays from throughout the galaxy were striking the planet's atmosphere and, like an exploding artillery shell sending materials every which way, neutrons were scattered hither and yon, including a population that went upwards away from the Earth. 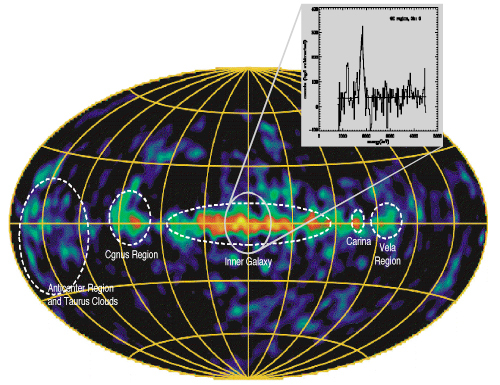 It was these neutrons that were suspected of populating the radiation belts – in some fashion. The next logical question was, since neutrons have no charge, how do the belts actually became filled with energetic particles capable of being captured by electromagnetic forces? One idea was that neutrons, after drifting up into space, would decay into the same energetic particles, such as protons and electrons, that Van Allen detected, but were there enough of them? This spawned research by UNH and others into measuring neutrons in the atmosphere that had been produced by cosmic rays from far reaches of the galaxy. Says Ryan, "So scientists at the Max Planck Institute, the University of California, Riverside, and soon thereafter UNH, put neutron detectors on balloon platforms and flew to the top of atmosphere in an attempt to measure neutrons going both up and down. And bobbing around at the top of atmosphere they discovered that most of them were coming up." By the mid-1970s the in-situ neutron measurements and calculations showing the number of neutrons (which decay into charged protons and thus get electrically trapped in the radiation belts) needed to populate the belts closely matched. "So we could close the book on that, and the measurements UNH did from balloons were mostly confirming earlier data, they helped seal the deal," says Ryan, who was a graduate student at the time and arrived at UNH shortly thereafter to continue work in both gamma-ray and neutron detection. 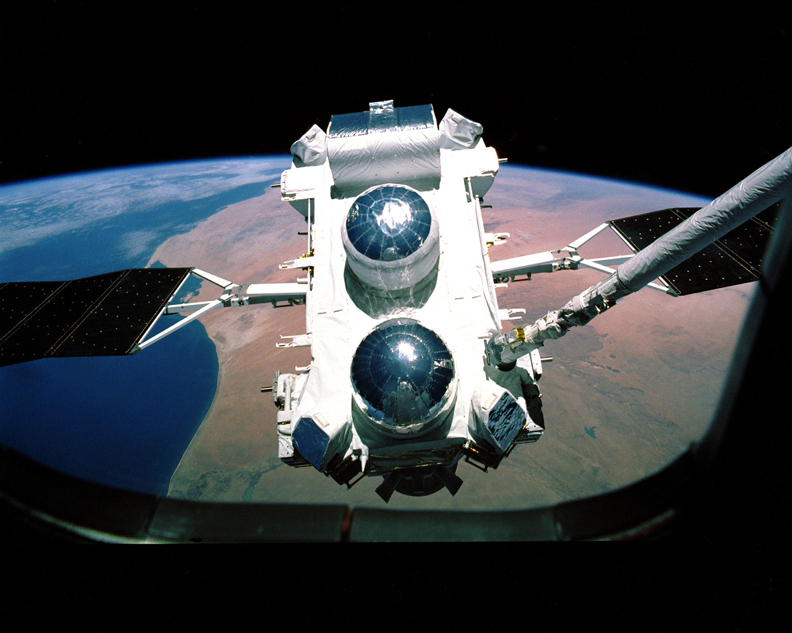 A view of the Compton Gamma Ray Observatory being deployed by the robotic arm of the Space Shuttle Atlantis on April 5, 1991. The COMPTEL instrument, developed in part at UNH, is the large dome-shaped object at the center of the CGRO spacecraft. Ryan was a member of the UNH research team that helped build and operate the gamma-ray imaging COMPTEL telescope onboard the Compton Gamma Ray Observatory (CGRO), a 1991-2000 NASA mission dedicated to observing the high-energy universe. This false color image from the CGRO mission shows how radioactive aluminum is strewn about in our galaxy. The second of NASA's Great Observatories, CGRO explored some of the most violent and energetic processes in the universe, including black holes, solar flares, gamma-ray bursts, and pulsars. It also mapped out sites where all of the heavier elements in the periodic table are created, a process known as nucleosynthesis, which is detected by regions of strong radioactive emissions. At 17-tons, CGRO was the heaviest astrophysical payload ever placed in orbit by a shuttle, in large part due to the slippery nature of gamma rays, which behave much like neutrons. Says Ryan, "In order to detect neutrons and gamma rays as well, it requires a lot of material to interact with. The particles carry a lot of energy but because they are so penetrating the instruments are bulky – it takes a lot of beef on the hoof to stop them." The COMPTEL experiment was headed up by Lockwood until his retirement, at which point Ryan took over as the principal investigator. SSC scientists and engineers who worked for many years on the COMPTEL experiment, and who remain at UNH, include Ryan, professor Mark McConnell, program manager John Macri, project engineer Stan Ellis, and research scientist Tom Milliman. 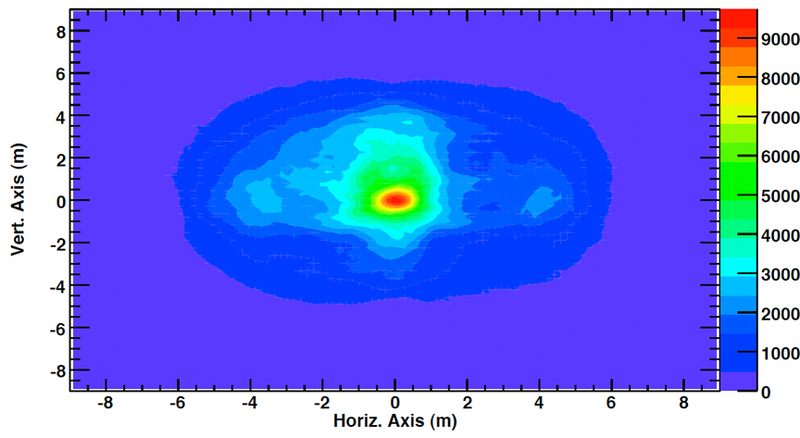 While CGRO focused on the gamma-ray side of the equation, the very same physics and detection techniques are being applied to Ryan's NSPECT device. "Over the years we've developed these instruments that are great for measuring high-energy particles like neutrons and gamma rays from deep space," Ryan says, "and we're now applying the same basic idea to NSPECT using today's much more sophisticated technologies, but the technique is very similar." 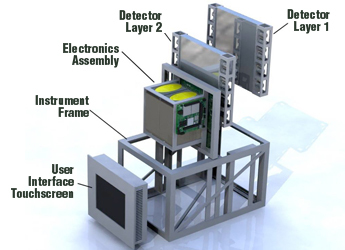 The NSPECT detector is worlds different from the neutron monitors Lockwood used, and in an entirely different league than the detector that rode Explorer 1 and got saturated in the radiation belts. In both instances, an encounter with their quarry produced a simple "click." "Because they're neutral, if you get a signal from a neutron, it means that it's produced a particle with an electric charge in your detector," Ryan says, "but if the detector isn't smart that's pretty much all you get. To be useful for, for example, locating illicit radioactive materials, you need a more complex instrument that follows the neutron and gives you information about its velocity and the direction it's coming from." A schematic of the Portable Neutron Spectroscope. Courtesy of Peter Tchoryk, Michigan Aerospace Corp.
A complex instrument like NSPECT. The false color image created by NSPECT shows the location of a neutron-emitting radioactive isotope similar to plutonium. Courtesy of James Ryan, UNH. "So what you try to do is measure how much energy has been dumped from the neutron into the hydrogen atom and then detect the direction in which that moderated neutron scattered by using a different detector," Ryan explains. Using such a technique, scientists can figure out how fast the neutron was going, and from that try to reconstruct the scattering geometry to determine how much energy was deposited in the scintillator and how much is left over when it skittered off in a new direction. "What you end up with is the ability to reasonably reconstruct what the energy of the neutron was in the first place, which is a real achievement because even when they do get detected they grudgingly yield the minimal amount of information," says Ryan. In keeping with UNH's expertise in the equally difficult work of gamma-ray detection (see story "From Soup to GRAPE Nuts" in this issue), Ryan believes the long-term commitment to this high-energy detective work has been well worth it. "We've invested a lot of time and effort over the years because we weren't afraid to tackle the tough problems. Sure, there are easier scientific avenues to pursue, but we knew there would be pay dirt. There's a tremendous amount of science to be had." And, potentially, a tremendous amount of safety to be gained should NSPECT, out in the field a few years hence, pick up the radioactivity from a dirty bomb, or worse.